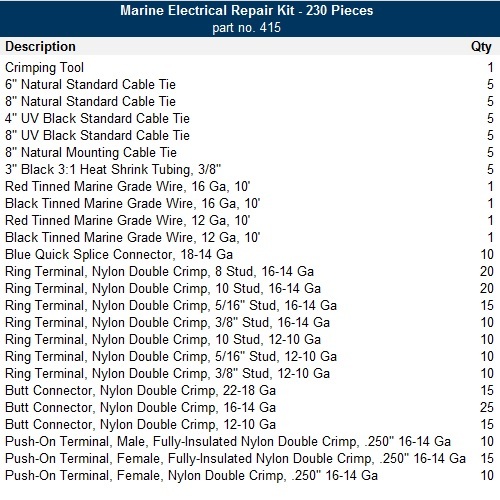 The marine electrical repair kit provides the security needed to set sail with confidence. Inside the kit is an assortment of premium nylon double crimp terminals, single-wall shrink tube, cable ties, tinned wire and a crimping tool. The security you need to set sail with confidence. Stocked with premium nylon double crimp terminals, single-wall shrink tube pieces, natural and UV black cable ties, UL approved tinned wire and a crimping tool. A little bit of everything for marine applications. All contained within a durable, lightweight, carrying translucent carrying case (11" x 6-3/4" x 1-3/4"). For a detailed list of kit contents call 1-800-654-4757.